Find a boutique hotel in Barcelona from Hotique's hand picked selection of barcelonas best hotels. Boutique hotel lovers are spoilt for choice in Barcelona – from the uber-romantic Hotel Neri, with only 22 rooms, to the modern design hotel, Hotel Omm, the former palace, Duquesa de Cardona to budget boutique Hotel Praktik Rambla, there is a Hip Hotel in Barcelona to suit all budgets. All hotels are in the centre of Barcelona – the Barcelona Barri Gotic area is also known as the Gothic Quarter and is the old town of Barcelona featuring historic buildings and cobbled streets. Find a stylish boutique hotel in Barcelona from the Hotique Hip Hotels Guide. Hotel Neri, Barcelona – Small, intimate and romantic – this former palace is located in the heart of the Barri Gotic, beside Placa Neri. With only 22 seductive rooms, it is one of Barcelona’s most romantic hotels. 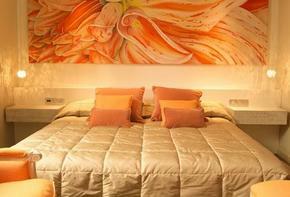 Grand Hotel Central – Fresh, modern rooms, with wooden floors and large plasma screens. Expect designer bathrooms and Korres bathing products. Duquesa De Cardona – At the south of the Barri Gotic, with views over the Marina, the hotel is a converted palace that is full of charm. Relax by the small rooftop pool, or explore the local boutiques of El Borne nearby. Hotel Praktik Rambla - Excellent location and great value for money with rooms from 80 - 100 Euros per night. Hotel Omm – Beautiful, modern design, night time bar, club and popular restaurant – at the top of Passeig de Gracia, ideal for shopping in Barcelona’s best designer boutiques. With a stunning Spa, spacious rooms and small rooftop pool. Granados 83 – Wooden floors, modern stylish rooms and lobby plus a small rooftop pool.